For college seniors, the path toward completing the requirements for a major may seem long and daunting, with years of classes, projects and exams. At Dickinson, those paths are more varied than at many other institutions, given that the culminating experience for each major is not the same. 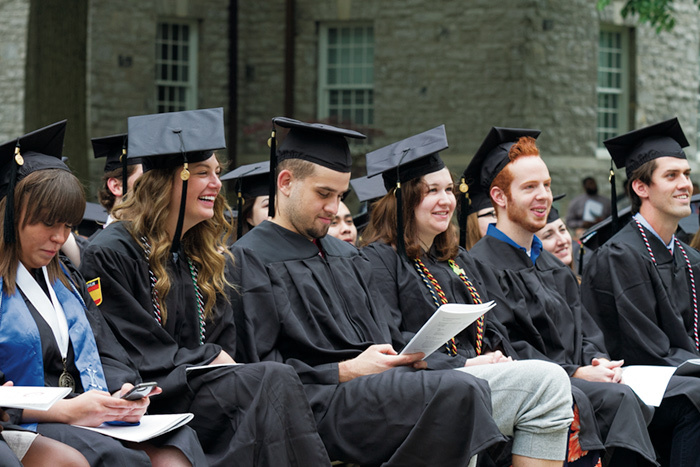 According to Senior Associate Provost of Academic Affairs Brenda Bretz, the reason for the variation is simple: Dickinson’s approach to academics is different. From capstone courses to theses, symposiums to performances, here is a sampling of the different approaches to senior year across campus. The senior thesis is one of the most talked-about topics leading up to an English major’s final year at Dickinson. From the first year onward, students muse on the required number of words and worry that reaching it is an impossible task. Not all students feel prepared at the beginning of their senior year, but the process of continually workshopping with peers makes the impossible possible. So after months of research, revision and peer and professor review, for English majors “done” is turning in roughly 35-50 pages of carefully crafted writing that will pull together their years of preparation and count toward 60 percent of their final grade. The American studies department also requires seniors to participate in a yearlong process of conducting research and compiling a thesis, but it requires an additional component: In the middle of the spring semester, majors come together to formally present their research at the department’s annual symposium and gain feedback that informs their final theses. The music department’s colloquium has been a part of the senior experience for the past 15 years. Students complete an assignment that corresponds with their chosen concentration within the major, often taking the form of a composition, score analysis, essay or performance with program notes. A formal presentation is not required for seniors in the studio art major, but they participate in the senior exhibition, which showcases the works of all students in the yearlong seminar. Additionally, studio art majors create a catalog that discusses in detail the art present in the exhibition. Extra, Extra … or Not! Like economics, the Spanish department requires a senior seminar without formal presentations or lengthy papers. And earth sciences used to require a senior seminar but developed a new model several years ago that allows students to choose a capstone experience that best prepares them for life after graduation. The course offerings of independent research, student/faculty collaborative research or participation in an internship aim to prepare students for graduate school or work in the industry, as well as synthesizing their undergraduate education. While presentations and theses are the most common senior capstone approaches, several departments have a different approach that better fits their program. Three years ago, international business & management began engaging seniors in a semesterlong consulting project. The project connects current students to alumni and allows them the chance to consult with companies such as Google, Procter & Gamble, McCormick & Company and Colgate-Palmolive, among others. International studies takes a different route and requires seniors to complete independent research in the fall and take two examinations, one written and one oral, in the spring. The written exam assesses their knowledge in the four areas of international studies and serves as a prerequisite to the oral exam, during which students sit in front of a panel of professors and answer questions to demonstrate their knowledge. Although the pre-examination worry for international studies students parallels the pre-thesis worry for English students, Associate Professor of International Studies (and department chair) and Political Studies Kristine Mitchell says it’s a part of the curriculum the faculty highly values. “Preparing for and completing the exam gives students the chance to pull together all the various parts of their interdisciplinary major—the economics, the history, the political science, the concentration—and think about how these different parts link up with one another,” she says. “It’s really a culminating experience for the students.” This is a sentiment expressed by many other department chairs in relation to their senior experiences. Katya Hrichak '17 turns her tassel, surrounded by classmates. Photo by Heather Shelley. The idea for this story came while Katya Hrichak ’17 (English, music) was working on her English thesis as well as her music colloquium. Along with noticing how different her two capstone projects were, she saw her classmates each undergoing very different assignments for their majors. As she started to explore further, the wealth of information got richer and vaster. This story is the culmination of 10 interviews and countless hours of transcribing, list-making and revision. It is a fitting end to her year as our student writer, during which she accrued more than 20 bylines! Congratulations, Katya!